Of the Levites, Aaron and his sons were chosen for the priestly office (Ex. xxviii. 1 et seq. ); the menial services of the Tabernacle were assigned to the rest of the tribe (Num. i. 47 et seq.). The Kohathites were to bear the sacred furniture of the Tabernacle; the Gershonites, its curtains; and the Merarites, its boards, pins, and poles (Num. iv. 4-16, 22-28, 29-33). It is distinctly stated that the Levites shall not approach the most holy things (Num. iv. 19)—that is, they shall not act as priests, a function which the context reserves for Aaron and his sons. In Deuteronomy the representation is quite different; "priests" and "Levites" are there synonymousterms, and the one is regularly placed in apposition with the other. In Deut. xviii. 1, apparently, every Levite is a potential priest. In Joshua, as in Numbers, the Levites consist of the clans of Kohath, Gershon, and Merari, and to each clan a large number of cities is assigned (comp. Josh. xxi. ; see Levi, Tribe of). The Levites, as the servants of the Temple, appear next in I Chronicles, where David is represented as dividing them into "courses" to wait on the sons of Aaron by doing the menial work of the Temple because they were no longer needed to carry the Tabernacle (comp. I Chron. xxiii., especially 26-28). He also appointed some to be doorkeepers of the Temple, some to have charge of its treasure, and some to be singers (I Chron. xxv.-xxvi.). Ezekiel, however, gives a somewhat different impression of the personnel of the Temple service in pre-exilic times. In ch. xliv. 9-13 he declares that in future no uncircumcised foreigner shall enter the Temple, and that the Levites who have served at idolatrous shrines shall be deposed from the priesthood and perform the menial services of the sanctuary, such as keeping the gates and slaying the offerings. This seems to imply that before the Exile this service had been performed not by Levites, but by foreigners (an impression which Josh. ix. 23 deepens), and that those who were accounted Levites in this subordinate sense had formerly exercised a priesthood, of which Ezekiel did not approve. After the Exile the Temple organization, as reflected in the books of Ezra and Nehemiah, is the same as that portrayed in Chronicles. The plan of Ezekiel was not altogether carried out, for the Nethinim, who were descended from slaves whom David had given to the Temple (Ezra viii. 20), shared with the Levites the subordinate work of the sanctuary (Ezra vii. 24). 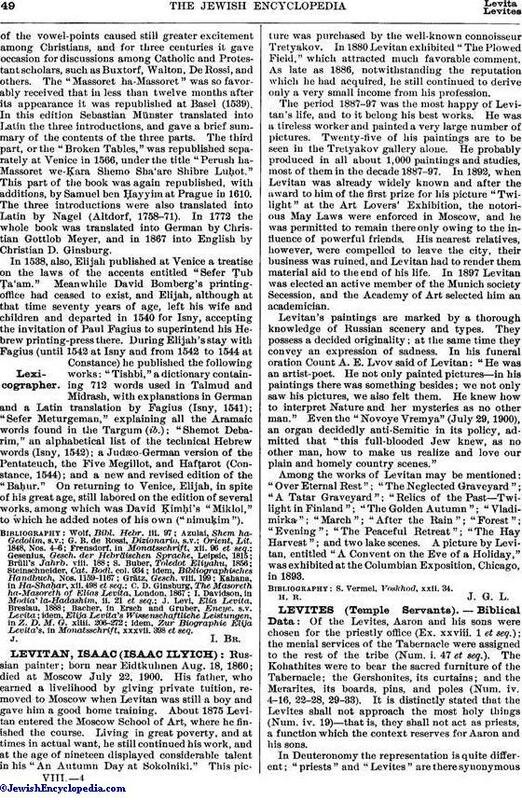 In later times it would seem that the distinction between Levites and Nethinim gradually disappeared; present information on this point consists solely of the fact that the Nethinim were given genealogies along with the Levites (Ezra ii. 40 et seq.). At the beginning of the common era the Levites were an important class of religious officials (comp. Luke x. 32; John i. 19). The Biblical data thus present two inconsistent views. According to Leviticus, Numbers, the greater part of Joshua, and Chronicles, the priesthood was confined to the house of Aaron from the first, and the Levites existed as a menial class for the performance of the subordinate work of the sanctuary from the time of Moses. 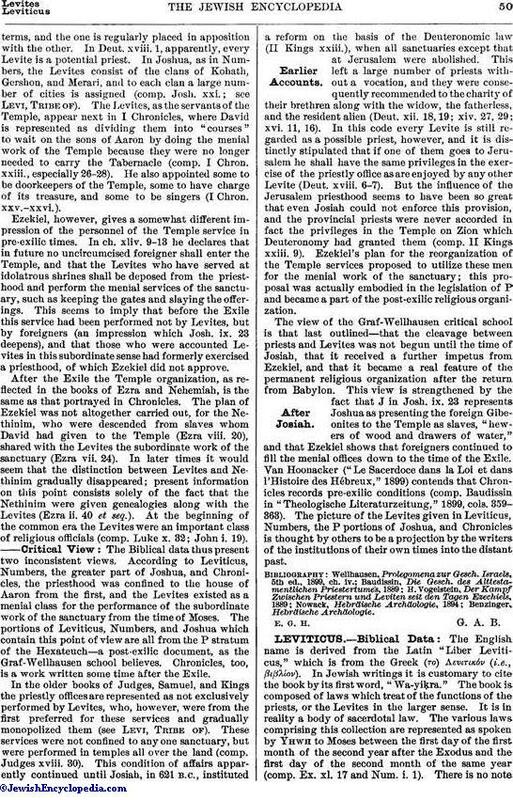 The portions of Leviticus, Numbers, and Joshua which contain this point of view are all from the P stratum of the Hexateuch—a post-exilic document, as the Graf-Wellhausen school believes. Chronicles, too, is a work written some time after the Exile. In the older books of Judges, Samuel, and Kings the priestly offices are represented as not exclusively performed by Levites, who, however, were from the first preferred for these services and gradually monopolized them (see Levi, Tribe of). These services were not confined to any one sanctuary, but were performed in temples all over the land (comp. Judges xviii. 30). This condition of affairs apparently continued until Josiah, in 621 B.C., instituted a reform on the basis of the Deuteronomic law (II Kings xxiii. ), when all sanctuaries except that at Jerusalem were abolished. This, left a large number of priests without a vocation, and they were consequently recommended to the charity of their brethren along with the widow, the fatherless, and the resident alien (Deut. xii. 18, 19; xiv. 27, 29; xvi. 11, 16). In this code every Levite is still regarded as a possible priest, however, and it is distinctly stipulated that if one of them goes to Jerusalem he shall have the same privileges in the exercise of the priestly office as are enjoyed by any other-Levite (Deut. xviii. 6-7). But the influence of the Jerusalem priesthood seems to have been so great that even Josiah could not enforce this provision, and the provincial priests were never accorded in fact the privileges in the Temple on Zion which Deuteronomy had granted them (comp. II Kings xxiii. 9). Ezekiel's plan for the reorganization of the Temple services proposed to utilize these men for the menial work of the sanctuary; this proposal was actually embodied in the legislation of P and became a part of the post-exilic religious organization. The view of the Graf-Wellhausen critical school is that last outlined—that the cleavage between priests and Levites was not begun until the time of Josiah, that it received a further impetus from Ezekiel, and that it became a real feature of the permanent religious organization after the return from Babylon. This view is strengthened by the fact that J in Josh. ix. 23 represents Joshua as presenting the foreign Gibeonites to the Temple as slaves, "hewers of wood and drawers of water," and that Ezekiel shows that foreigners continued to fill the menial offices down to the time of the Exile. Van Hoonacker ("Le Sacerdoce dans la Loi et dans l'Histoire des Hébreux," 1899) contends that Chronicles records pre-exilic conditions (comp. Baudissin in "Theologische Literaturzeitung," 1899, cols. 359-363). The picture of the Levites given in Leviticus, Numbers, the P portions of Joshua, and Chronicles is thought by others to be a projection by the writers of the institutions of their own times into the distant past.